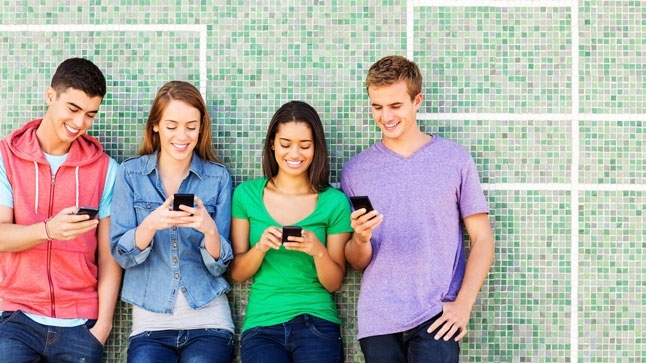 Is your teen’s smartphone literally a pain in the neck? Today’s teens love their smartphones. Many parents, tired of competing for attention with the ever-present devices, would say cell phones are a pain in the neck. Turns out, those parents might be right. Doctors who specialize in spine disorders report that more patients are complaining of a phenomenon sometimes referred to as “text neck” — neck and back problems caused by hunching over smartphones. “We see both back and neck pain associated with poor posture during phone use,” says Langston T. Holly, MD, FAANS, co-director of the UCLA Spine Center. While plenty of adults are guilty of huddling over their phones, children may be particularly vulnerable given the amount of time they spend attached to their devices. Too often, poor posture and smartphone use go hand-in-hand, which can be surprisingly hard on your neck, according to a 2014 study published in Surgical Technology International. Tipping the head forward and downward a slight 15 degrees is equivalent to adding 27 pounds of weight to your cervical (neck) vertebrae, the study found. A 60-degree downward gaze is comparable to hanging a 60-pound weight from your spine. Usually, neck pain from poor posture is just a form of muscle strain. “However, if it continues over a long period of time, it is conceivable that the joints and discs within the spine could wear out prematurely,” Dr. Holly adds. That degeneration of the spine could cause long-term pain and even require spine surgery. Learn more about spine health and treatments for back and neck pain at the UCLA Spine Center.